A 22-centimetre high mattress for couples with an upper layer made of Sanitized antibacterial foam. Protects against fungus and mould and is also able to protect the foam from the unpleasant odours caused by such organisms. SANITIZED protection guarantees that this mattress has a longer lifespan and is a better environment on which to sleep. The next profile is made of Eliocell foam of varying densities, put together in such a way as to ensure the perfect firmness and springiness of the mattress. The Algua cover contains micro-pockets with extracts of Spirulina seaweed, which contains 11 natural vitamins, 10 minerals, 18 amino acids, 3 fatty acids, beta carotene and a number of antioxidants and proteins. These are released while you sleep, nourishing the skin. ALGUA stitched with Supersoft foam and PES fibre, 100 g per square metre. 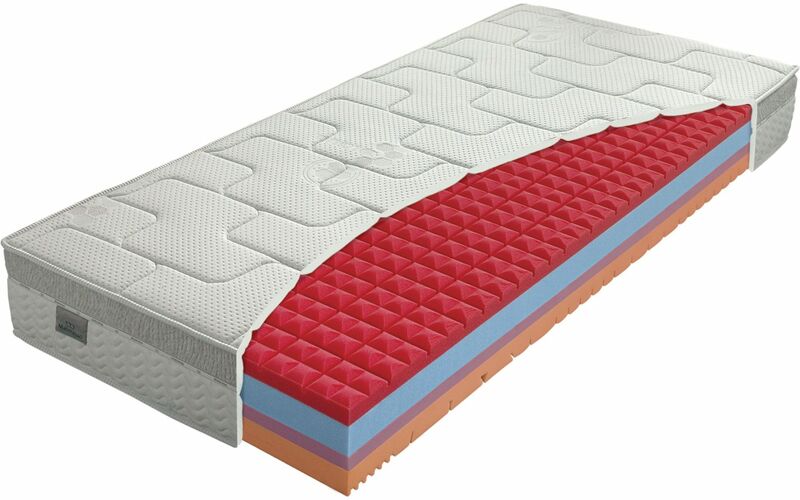 Upper profile: SANITIZED antibacterial comfort foam.Mattress core: Comfortable ELIOCELL foam, density 25 kg per cubic metre. - softened ELIOCELL comfort foam, density 25 kg per cubic metre. Lower profile: ELIOCELL foam, density 28 kg per cubic metre.